From 1976 to 1980 – it was monotonous – Bjorn Borg continued to win Wimbledon and in 1981, the young tantrum throwing John McEnroe beat him. In 1985, another young acrobatic player emerged – I did not like him those days, primarily because, he defeated Ivan Lendl in the finals of 1986. Lendl was to lose again in 1987, this time to Pat Cash. Boom boom Becker, as he was known then - Boris Franz Becker was six-time major singles champion, was the youngest Wimbledon men's champion when he was 17 years, 7 months and 15 days. He also won five year-end championships, 13 Masters Series titles, and an Olympic gold medal in doubles. Tennis magazine ranked him the 11th best male player of the period 1965–2005. After his playing career, he coached Novak Djokovic for three years beginning in 2013. 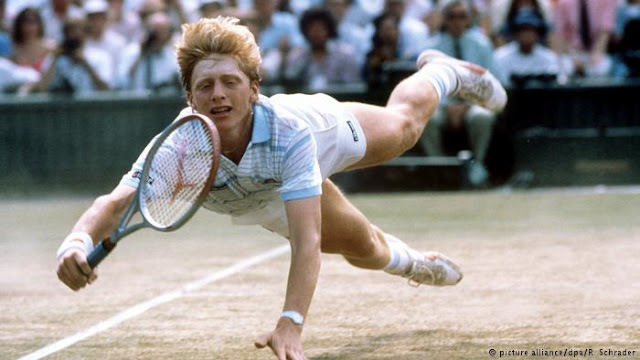 It was 1985 – Becker burst on to top fame becoming the first unseeded player and the first German to win the Wimbledon singles title, defeating Kevin Curren in four sets. Becker was at that time ranked 20th in ATP ranking, and was unseeded, but Wimbledon did not then seed players beyond the top 16. He was the youngest ever male Grand Slam singles champion at 17 years, 227 days (a record later broken by Michael Chang in 1989, who won the French Open when he was 17 years, 110 days). An year later, Becker successfully defended his Wimbledon title, defeating world no. 1 Ivan Lendl in straight sets in the final. In 1987 Becker, then ranked world no. 2, was upset in the second round of Wimbledon by the world no. 70 player, Peter Doohan. In the Davis Cup that year, Becker and John McEnroe played one of the longest matches in tennis history. Becker won 4–6, 15–13, 8–10, 6–2, 6–2 (at that time, there were no tiebreaks in the Davis Cup). The match lasted 6 hours and 22 minutes. Becker was back in the Wimbledon final in 1988, where he lost in four sets to Stefan Edberg in a match that marked the start of one of Wimbledon's great rivalries. Becker also helped West Germany win its first Davis Cup in 1988. Boris had it all — six grand-slam tennis titles, models hanging off his arm and luxury houses all over the world. At the height of his career, the German ace had amassed a reported $63 million in prize money and sponsorships, but now the man once known as “Boom Boom” for his ferocious serve has gone from boom boom to bust ! 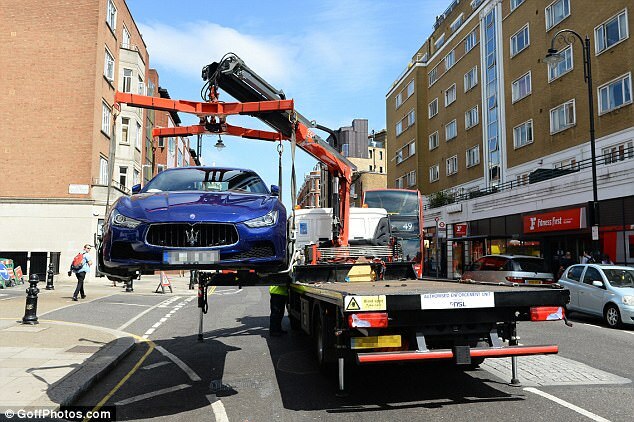 UK media including Daily Mail is agog about - Boris Becker's £65,000 Maserati being towed from the tennis star's private members club after he was made bankrupt over debts of more than £3 million. The towing truck came after the Wimbledon champion was slapped with parking tickets on his two sports cars in west London. The tennis ace, 49, parked his red porsche and blue Maserati in South Kensington on Monday morning as he arrived at his private member's club. But a traffic warden found his cars and tucked penalty charge notices under each windscreen. Kensington and Chelsea council told MailOnline cars are usually only towed away if they are causing an obstruction or if they are parked in a suspended bay. They added that a car can be towed by the council at any point after a ticket has been issued. 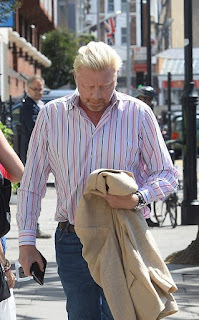 Boris's Maserati has been moved to a pound in Chelsea and the tennis ace will have to fork out £200 as well as the parking fine, to get his roadster back. If the car is not reclaimed on the day of the towing, an extra £40 is added each day it is not claimed. Kensington and Chelsea council charge up to £130 for parking illegally, but it is unknown how much he was charged. It appears that the Maserati was parked on a single yellow line and on top of hatched markings, where cars are not allowed to go on the road ! Even though he has been declared bankrupt, the Wimbledon champion was seen driving his £80,000 Porsche Cayenne GTS and his Electric Blue Maserati GHIBLI S, which starts from £65,000. It is believed the Maserati was already parked outside the private members club and had received a ticket when Boris pulled up in his Porsche. Despite his financial woes, the sportsman turned commentator was also seen entering his private members club, the South Kensington Club. According to Business Insider, the exclusive club charges monthly fees from £365 as well as an £1,000 joining fee. Earlier this week, Boris was declared bankrupt over debts of more than £3 million. The club, which doesn't require applicants to be proposed by a current member, writes on its website: 'It’s not about who you know, it’s about who you are.' The South Kensington Club has a focus on fitness and wellbeing, boasting a gym, bath house and beauty treatments. Matters could get even worse for the former tennis star after claims that his eight-year marriage to model Lilly Becker is on the rocks. The fall to disgrace appears sudden and somehow many stars have squandered all their earnings, unable to cope up with pressures of living, which many simple persons do at ease. Have heard of actor comedian Chandrababu living in chill penury after losing all his earnings. Some other stars who turned bankrupt include Mike Tyson, David James, Diego Maradona, John Arne Riise, Chris Cairns, Lawrence Taylor and a host of others. Sad or what to say ! – while some struggle for a decent living, some squander all their fortune after amassing quite huge sums ! !